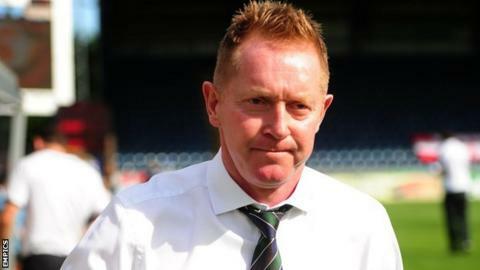 Oxford United manager Gary Waddock has said his players are "drained" and "devastated" after their third defeat in a row saw them move out of the League Two play-off places. United were beaten 2-0 by Fleetwood and Waddock admitted confidence is low. "Losing has become a habit and we need to turn it around very quickly," Waddock told BBC Radio Oxford. "Fleetwood's goal deflated us, it affected our confidence. We don't have enough, what we had drained out of us." Waddock has also now lost his first three games since taking over as manager and with five games left the club are in danger of missing out on a play-off spot. And he admits time is running out for his players to turn around their poor form. "We have to be mentally stronger and we haven't got a lot of time to put it right," he said. "The players are responsible for their performances but we are all in it together. We have to be more positive in everything we do. "We have to knuckle down, work hard and get back in there. At the moment things are not going our way. "The players are devastated. They've worked so hard to get where they are in the league table and we've popped out of the play-off places. But we will only know where we finish at the end of the season. "We've got big games coming up and we need to put it right." Waddock also believes the pressure may be off his players now they have dropped out of the top seven. "It might be a relief to the players," he said. "The lads have probably been looking over their shoulder and now they have to stand up and be counted."